Townend, Paul. "Meg Tilly". The Canadian Encyclopedia, 04 March 2015, Historica Canada. https://www.thecanadianencyclopedia.ca/en/article/meg-tilly. Accessed 26 April 2019. Meg Tilly, née Margaret Elizabeth Chan, actor, author (born at Long Beach, Ca 14 Feb 1960). Meg Tilly was brought up on the isolated Texada Island in the Strait of Georgia. She began her career as a dancer but switched to film after a back injury. (Photo Laurie L. Campbell, courtesy Meg Tilly). 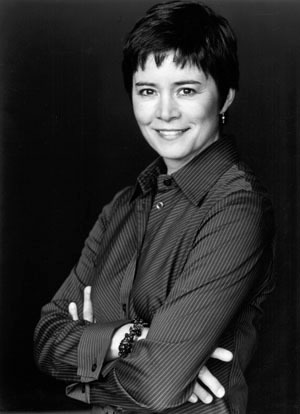 Meg Tilly, née Margaret Elizabeth Chan, actor, author (born at Long Beach, Ca 14 Feb 1960). Meg Tilly was brought up on the isolated Texada Island in the Strait of Georgia. She began her career as a dancer but switched to film after a back injury. She arrived in New York at age 16 and made her screen debut as a dancer in Fame (1980). She appeared in the popular Big Chill (1983) as the girlfriend of the dead man whose friends gather for a weekend, and received the Golden Globe Award for best supporting actress as well as a supporting actress Oscar nomination for her portrait of a young nun in Norman Jewison's Agnes of God (1985). Her other films roles include Valmont, Psycho II, Leaving Normal, The Two Jakes and the 1993 remake of Invasion of the Body Snatchers. In 1995, she gave up acting and moved to Vancouver Island. Meg Tilly is the author of two adult novels, Singing Songs (1994) and Gemma (2006); both relate to her childhood experiences as the victim of physical and sexual abuse. Her first young adult novel, Porcupine, was released in 2007 and shortlisted for a BC Book Prize, the Canadian Libraries Association Best Children's Book 2008 and the Foreword Magazine Book of the Year Award 2008. Her second young adult novel, First Time, was published in 2008, and received a CCBC Best Book award. In February 2013 A Taste of Heaven (a middle-grade book) was released. In 2011 Tilly returned to acting, playing Martha in Who's Afraid of Virginia Woolf? at the Blue Bridge Repertory Theatre in Victoria. In 2012 she won a Leo Award, which celebrates excellence in BC film and TV, for her performance in the television series Bomb Girls, shot in Vancouver, about women working in a munitions factory during the Second World War. That year she also appeared at Tarragon Theatre (Toronto) in The Real World? by playwright Michel Tremblay. Meg Tilly is the sister of actor Jennifer Tilly.